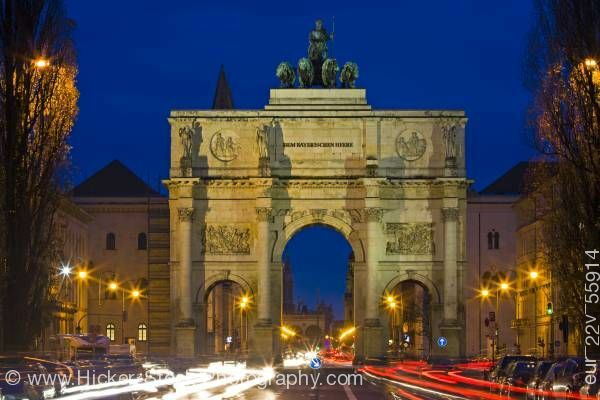 Stock photo of the Siegestor (Victory Gate) with traffic flowing around it at dusk in the Schwabing district in the City of Mnchen (Munich), Bavaria, Germany, Europe. Siegestor (Victory Gate) with traffic flowing at dusk in the Schwabing district in city of Munich. This stock photo shows traffic flowing around the Siegestor (Victory Gate) has three archways at dusk in the Schwabing district in the City of Mnchen (Munich), Bavaria, Germany, Europe. A three-arched stone monument with a bronze statue above is the Siegestor, Victory Gate, which stands in the Schwabing district in the city of Munich. The large bronze statue stands at the top of the monument has a man holding a staff and with his rein he guides four lions. The gateway has carved statues in wonderful detail that stand above four round columns. Two carved artwork sits between the statues with another two carvings between the columns just above the two smaller archways. This evening view shows the blurry lines of red and white lights from the continuous movement of the automobiles. The Siegestor (Victory Gate) with traffic flowing around it at dusk in the Schwabing district in the City of Mnchen (Munich), Bavaria, Germany, Europe.